It affects us deep in our core, and the impacts are profound. When a loved one passes, we feel we are losing an important part of ourselves. The grief can be overwhelming, and it’s often hard to see anything other than pain and loss. When you lose someone you love, even just getting through each day can be a real challenge. So, it’s hard to believe any good exists in such tragic events. While we can’t always see it — and it doesn’t lessen the pain and loss — good things do exist in such events. Death is part of life. It’s inevitable and unpredictable. It’s harsh and uncomprimising. It’s also a great teacher. Even during its painful lessons, good things exist. Recognizing and appreciating these good things can help us in our grieving process — and in everyday life. When we lose someone we love, we often reach out to others, and others reach out to us. We reconnect family, friends, and others. We share experiences, memories, emotions, and time. We understand each other better. We help each other. We share our appreciation of each other. We grow our appreciation of each other. Through all these, we forge stronger bonds, and we become closer. We reconnect, and connect in new ways. Additionally, death reminds us to reconnect our love for people with the actions we take. It’s easy to become complacent and to lack mindfulness in our daily life. As a result, we can forget to show people the love that we share with them. When we lose someone we love, it reminds us to really show and share the love we have for each other. We tend to rush through each day, often feeling like we’re barely staying above water. As a result, we don’t usually take time to look deeply at the life we’re living. When a loved one passes though, death forces us to pause and reflect. It pushes us to look at the life we are living. It prompts us to look the actions we are taking, or aren’t taking. Death reminds us to examine the values we hold in relationship to the way that we live. When we pause, we begin to remember what is really important to us. We regain an awareness of the important parts of life that often get lost in the fray. We also see things we regret. We see things we wish we’d done differently. We see opportunities we missed. These regrets can be hard to deal with, and hard to accept. At the same time though, our seeing these regrets gives us an opportunity. We can prevent regrets before we have them. We get a glimpse at regrets we might have in the future if we don’t alter our behavior now. These regrets offer us an opportunity to learn, to grow, and to become more skillful in our actions. While we can’t change the past, we can learn from it. As a result of pausing and reflecting, we can interact with the now in a more mindful way. When a loved one passes, death offers us a chance for a new understanding and perspective of our life. As mentioned above, it helps us see areas we didn’t live the way we wish we had. That allows us to see how we can do better from now on. It opens our eyes to the more important parts of life that we often lose focus on. Additionally, it allows us to understand ourselves and others better. We gain insight into our emotions, thoughts, and values. In these times, our interactions with others tend to be more open. We share in our deeper emotions and thoughts. We get a glimpse of our shared suffering and shared lives. As a result, we can better empathize with others. We remember that other people are also suffering in life and need compassion. Further, we recognize others might be suffering in similar ways and not showing it. This helps us be more patient and forgiving. We also get a glimpse of how ultimately we’re all in the same boat. In life, we all encounter death. We all face loss and suffering. We all face difficult challenges. Importantly though, this also means we all can share in life’s struggles. At a very core level, we all share common ground. More so, we all can help each other. Additionally, when a loved one passes, death forces us to see that change is inevitable. No matter how much we want to hold on to moments, people, and things in life, change will come. It shows us there are many things in life we can’t control, no matter how hard we try. Understanding this can help us let go of what’s beyond our influence. This allows us to redirect our efforts and energy into what we can control — the way we interact with our own thoughts, emotions, and mind. When you lose someone you love, it’s a stark reminder of how precious life and each moment is. Death forces us to see life’s fragility. 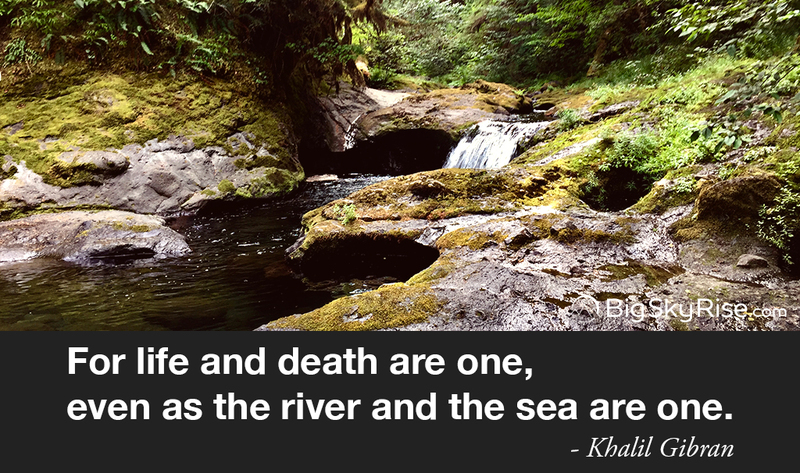 Through this, death helps us appreciate the specialness and uniqueness of each moment. It pushes us to treasure the people in our lives. We regain an awareness of the fact that death can come at any time. When we understand this, we’re less likely to take our time together for granted. We appreciate moments more. We appreciate the good things in life to a greater extent. This helps us live with greater gratitude. It helps us live with greater presence in the moment. Those things can ultimately helps us live happier, more fulfilling lives. To lose someone you love is one of the greatest challenges there is. Words can’t capture or convey what it’s like. At the same time, when a loved one passes, death offers take-aways that can help us reconnect with life. It provides a way to gain greater understanding and appreciation of life. It is a reminder and a chance to start showing others the love we share with them in a deeper way. It’s a point for reflection and an opportunity to reprioritize our life. We can more easily let go of things that aren’t really so important. We can see that life itself is infinitely valuable. With this we can rebalance. We can learn. We can grow. We can do better. To say it’s incredibly difficult doesn’t come close to capturing it. At the same time, this is still an opportunity find positives. When a loved one passes it is one of the most difficult things we face. It affects us deep down and in countless ways. While it can be hard to believe there is any positive to losing someone you love, even death offers lessons that can help us. Through death, we can learn to live life better. Open yourself to seeing positives even in your greatest difficulties. Actively look for the positive, and the opportunity for growth in the challenges you encounter. What are some of the good things you’ve found during the difficult times when a loved one passes? Leave a comment below, tweet me @bigskyrise, or join the newsletter and simply reply to any email. P.S. Should have had this originally, adding it now (2018-04-30). Everyone’s circumstances and situations are different. Likewise, our grieving processes are uniquely our own. It’s not possible to know exactly what someone else is going through. Nor is there some set and defined way to go through it. We are not alone in grieving, still each situation is uniquely our own. So, what I’m saying here — and in my other posts — comes from my experiences. Losing a loved one is terrible. The loss, pain, challenges, and struggles are very real. Exercises like what I talk about in the article don’t take that away. It doesn’t change the situation. It doesn’t make struggles disappear. Knowing this going in is important. For me, searching for and finding the good — as talked about above — helps me relate to a very tough situation in a healthier way. I am better able to reconnect with life. I can better see the good in my circumstances. I can better direct my focus and perspective. In other words, exercises like this help me feel the other aspects of life, in addition to the loss, pain, and struggle. Exercises like this don’t wash away the loss. Expecting otherwise leads to disappointment, at the very the least. More so, it’s quite dangerous to use exercises like this as a way to pretend the pain or struggle isn’t there, or that it doesn’t deeply hurt. My hope for anyone trying out this exercise is to use it in a healthy way. It’s not intended to be used to put a veneer of false positivity over what’s happening. False positivity leads to very real consequences, and can make situations worse. Instead, it’s a way to rekindle an awareness. To see what’s worth being grateful for in life, as it is now. Of course, like mentioned above, everyone’s situation is uniquely their own. For whatever you’re going through, it’s possible this approach will be of no benefit. In that case, you should certainly feel comfortable tossing it aside.